The first weekend of Regional competition has come to a close. In the typical fashion of CrossFit competition, the doors were blown off. The event was both inspirational and unbelievable; a perfect start to a month of regional events. The following report comes from the organizer. A 355lb clean & jerk, fast mile times and blazing times in the masters class cap the day. Skip Miller, of Front Range CrossFit sent the following update from the North Central Regional competition. Key players for this weekend's event. 2nd Place finisher from the Mountain Sectional. Here are the workouts for the first US Regional next weekend! Crucial Information for individuals and teams. 3rd Place finisher at the Mountain Sectional. Kelly Jo Smith may have a dance background, but she’s been throwing around weights for quite some time. 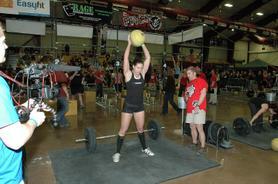 She is currently the Head Trainer of CrossFit Montana and is hungry for a spot at the 2010 CrossFit Games. John Brown, of CrossFit Agoge, was on hand to report on the action at the Mountain Sectionals last weekend. Announcing the Mountain Sectional Day 1 workouts. Two workouts will be completed simultaneously; the men will have first crack at Workout 1, while the women complete Workout 2. After lunch, the men and women will switch. One-off bumpers for the Mountain sectional. How mountain girls can love... CrossFit. CrossFit Games monsters and affiliate owners Matt Chan (18th in 2009, 8th in 2008) and Cherie Chan (15th in 2008) are introducing a fresh group of firebreathers to Games competition, enter Emmalee Moore.